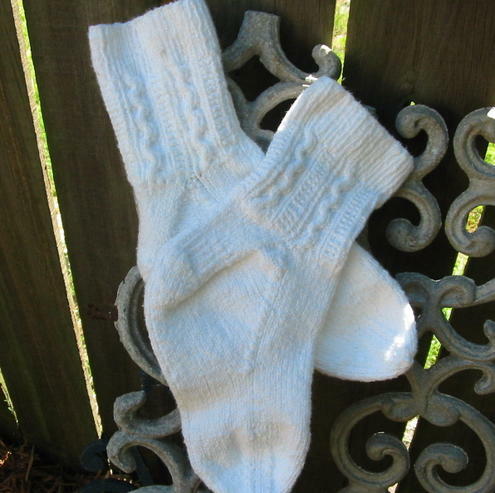 While growing up in Germany, I often observed my Tante Birgitt knitting socks for my uncle and my two cousins. My uncle wore nothing but hand knit socks. My cousins probably appreciated them less. As socks go, they were pretty basic, either tan, brown or loden green. Just a simple stockinette stitch, turned heel, etc. I was very impressed, mesmerized by the intricacies of the gusset, turning of the heel and the decreasing toe. Although I knit, pot-holders, simple scarves, headbands, socks were so out of my league. As I grew older I switched to crochet. The triangular shawls were all the rage in the 70's as were white cotton bucket hats and I even crocheted a hot pink bikini that I wore several summers. Fast forward to Amerika. I reconnected with a friend that I made here while in my early '20's. We used to love to cross stitch together and I taught her to crochet. During our years apart she learned how to knit and when we were back in touch she shared her love of the Six Sox Knitalong. 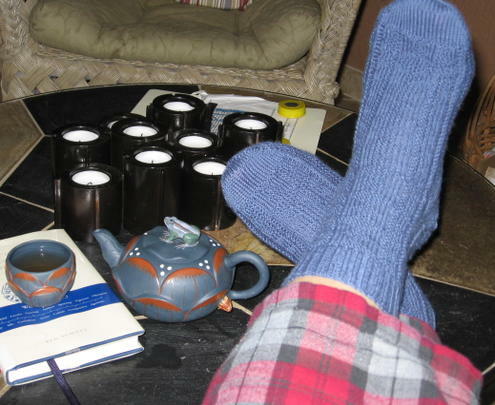 I had never heard of a knitalong, let alone for socks. But I was intrigued and took a look. I signed up and began my first KAL sock, Chutes and Ladders. I found out that I could knit socks; and better yet, if I had any sock knitting questions, I had a host of sock knitters to ask, including my old friend. 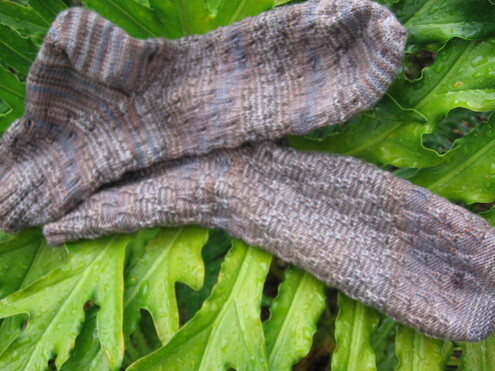 I fell in love with socks and the wonderful sock yarn in all fibers and colors. 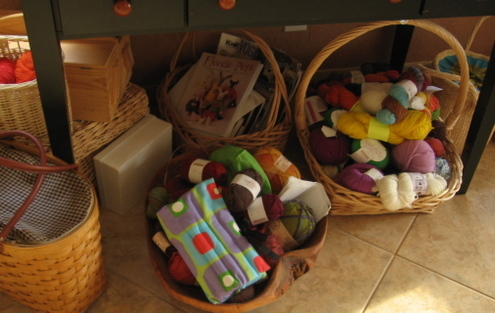 I quickly developed a stash and then join two sock clubs and now my sock basket runneth over. I fell in love with these little portable knitting projects. I can splurge on the most luxurious yarn and not break the bank. 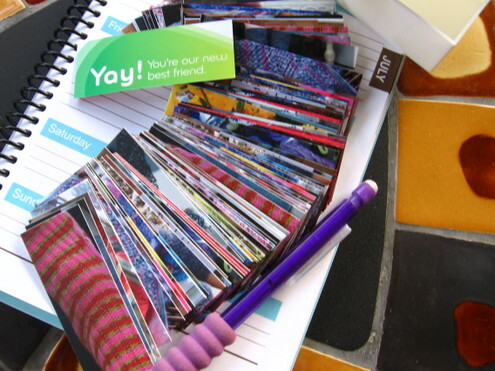 I am able to try out crazy colors, unusual fibers, and endless stitch patterns. I can knit cuff down, toe up, sideways. The heels and toes also provide endless challenges. Best of all the socks are knit in quick time. Whats not to love. I am now knitting socks for the family and sending them overseas. My Tante Birgitt came to visit last year and she paid me the highest compliment. She told me that my knitting skills were far beyond hers. She was genuinely impressed and I was touched. I do not live in a climate that is conducive to wool hosiery of any kind. I mostly spend my days in sandals. My socks linger in a drawer only to be taken out on occasion to show off my skills to anyone interested in looking. But, when the weather dips into the low '70's, cute pedicure be damned, I wear those socks, a different pair each day of the week. Just a little knitting update so I can say that some knitting has taken place. Tom and I actually put the boat into the water for the first time this season. My sock went along for the ride. 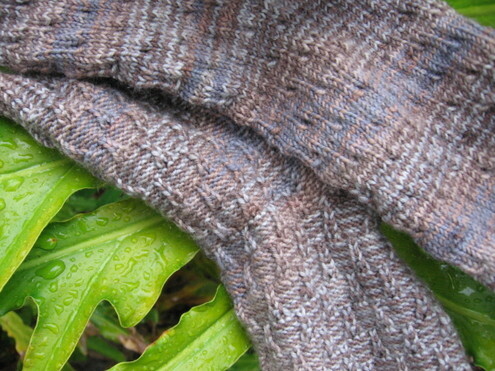 I am rotating between Victorian lace Sock 1 and Marble Arches Sock 2. Most of the weekend was spent cataloging yarn and projects in Ravelry. Here is another item that I received in the last weeks mail. Firebird is the newest STR yarn installment. I am woefully behind knitting up the sock yarn. I also snuck two skeins of the new Handmaiden Fleece Artist Sea Wool into the stash. Now that I have the Vintage Velvet off the needles, I think that I will concentrate on the Stormwater shawl that I've let languish as a WIP for to long. Now that Erik is heading to the pool at 6:00 AM every morning, I have extra time to read and catch up on what’s on my blog rolls. I recently downloaded the new Office 2007 Beta and it captures updated RSS feed in Outlook. I find that very handy because I can read my email and updated blogs at the same time. While catching up I found an article that pointed me to a site that parses HTML in any site entered using a Java applet. What you see blooms before your eyes and makes quite a pretty display. This is what my site looks like. I have been diligently knitting the back of the Debbie Bliss Split Cable Top and hope to have that piece completed by the end of the weekend. My fingers are itching to knit the front and watch the cable materialize. The cotton silk aran is very nice to knit with. One skein knits up very quickly and it seems as though I am blowing through the package of yarn too quickly. The back is all moss stitch and features a defined waist through shaping. My other project is the Jaywalker sock. I am using the Woolarina yarn that I purchased a few weeks ago. I started the sock over the Memorial Day weekend campout at Disney. For more reasons than I care to recall, the poor sock was started and frogged a total of 6 times. I think that I may finally have the stitch count/needle combination right and am on my way to starting the heel flap. Thanks to Cara from January One for pointing me to the KAL archives and a host of Jaywalker tips. I hope to read through the lengthy instructions that make up the new 6Sox KAL June/July pair this weekend. 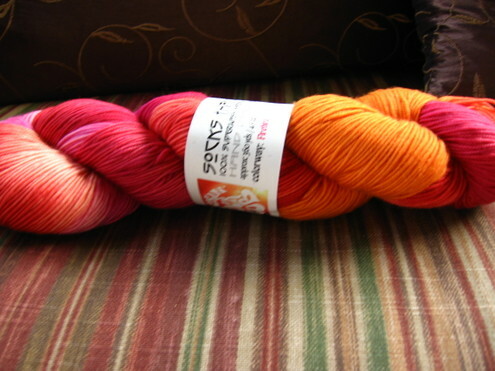 I am still waiting for hand painted yarn that I ordered mid May from a Furry Yarns in Maine. By my calendar, the package should have arrived long before now. I am woefully behind on my news for May. The weather has turned hot over the last few weeks and my motivation down. That has not been keeping me from shopping for yarn. I received several parcels over the last few weeks. 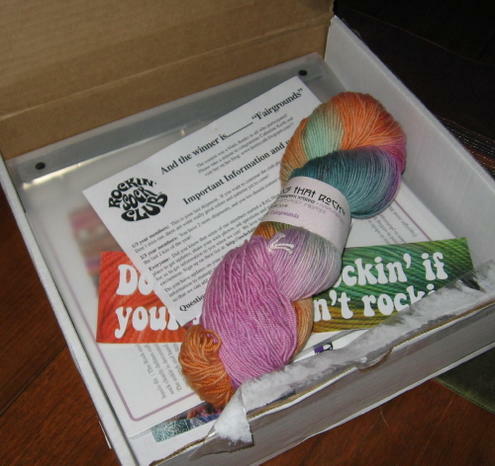 I joined the Socks that Rock Club and have received my first shipment of a yarn called “Fairgrounds”. It came with a nifty little key ring sporting a skein of yarn and a notebooks and bumper sticker. 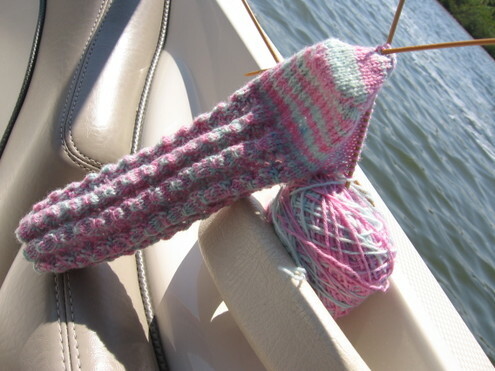 There is a sock pattern as well, although I’m not so sure that I will use the yarn for that. Debbie Bliss Book 3 and a ton of Cotton Silk arrived from Elann. I had bought the yarn in the hopes of making the Rougue Hoodie. The yarn is not elastic enough so I’m making the Split Cable Top in the Bliss book. I have managed to cast on the back. 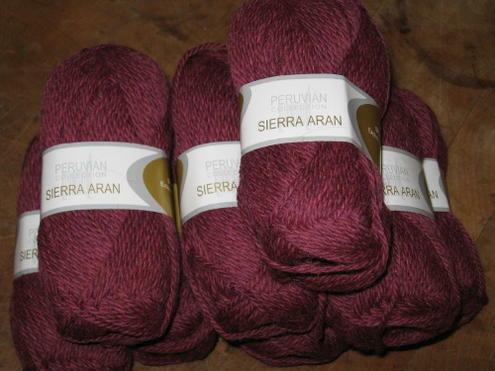 I reordered some Damson Plum colored Peruvian Sierra Aran from Elann for the Rogue Hoodie. 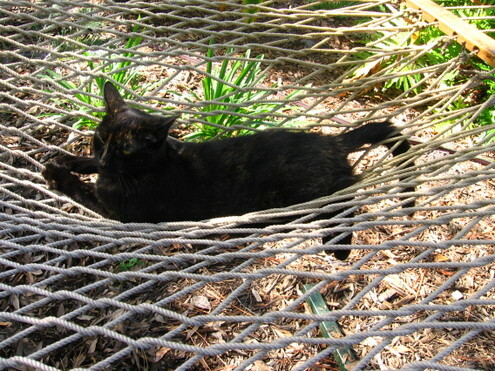 I have not decided when I will make time for that project. In addition to the above, I received the new book “YNotKnit”. I had heard about it…where else…a podcast, don’t know who’s. It looks like a great book for perfecting the Continental method of knitting. I already knit left handed but I thought that I could use some more tips. The library has also been good to me. I have checked out the following books; “Loop D Loop”, “Knitting without Tears”, “So Simple Knits”, and "Readers Digest Two Stich Knits". I am reading the Elizabeth Zimmerman book and can understand why it has remained so popular. She’s such a great writer. I have not gotten to the patterns yet but her explanation of the knitting stitches and methods are fantastic. Our family spent the Memorial Weekend camping at Disney’s Fort Wilderness. It’s been some time since we’ve joined the annual neighborhood trek into the “backwoods”. I forgot the amount of work, the setting up and taking down, that is involved. In between all the work I managed to cast on the Jaywalker socks. I cast on, frogged and cast on and frogged…something was wrong. The socks were so small. I finally figured out that I had to insert a row of knit between each zigzag row. DUH. Now I have to start again because the socks are too large. Maybe this will make a case for the gauge swatch. I’m sitting here at my desk; its midnight and I can’t sleep. There is a full moon on the rise coupled with an unfamiliar nocturnal sound, thunder in the distance. Our fair state has been plagued by a drought that has lasted for too many months. We had a bit of rain today, just enough to give the air a damp smoky odor. No the lightning will add another element of danger to the already parched earth. The end of May begins the rainy season. We can only hope. I have finished the second Amble sock. I am so pleased that I persevered. The second half of a sock pair are so much more enjoyable to knit. I used the Jaeger Matchmaker that was also used in the prototype. I was listening to Brenda Dayne’s Cast-On Episode 8, I think. It was the show with tips for new knitters sent in by listeners. One tip really hit home for me, well 2 actually. Knit loose, not so tight. This is a particular affliction of mine. Going up a needle size would help as well. Secondly, swatch. 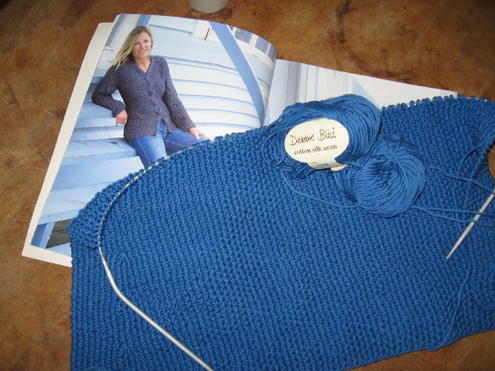 I have never knit a gauge swatch. It’s probably why my projects are hit and miss at times. I have invested (read $$$) in some more elaborate projects that I want to start when I’ve cleared my knitting deck a tad more. The Lady Eleanor shawl in Noro Silk Garden and the Rogue Hoodie in Debbie Bliss silk cotton. The shawl is not such a worry. I already knit with the Noro earlier this year. It’s the Hoodie that has me a bit nervous. Sweaters are not my forte. I mean sweaters meant for me. The have never fit quite right. The yarn should be hitting my door any day. I hope that it will suit the pattern of many cables. I have also been squirreling away balls of Anny Blatt Antique in Argent. I think that I've amassed 30 or so balls. It all started when Connie placed one on my desk at work. Antique is about $15 for a 50 yard ball. But its just so sparkly. Now to find a pattern. Speaking of yarn, I’ve been on somewhat of a buying binge. 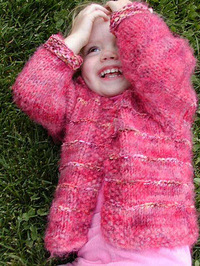 I read blogs and am intrigued when a pretty yarn catches my eye. The latest temptation is Pirate Yarn from the Yarn Wench. 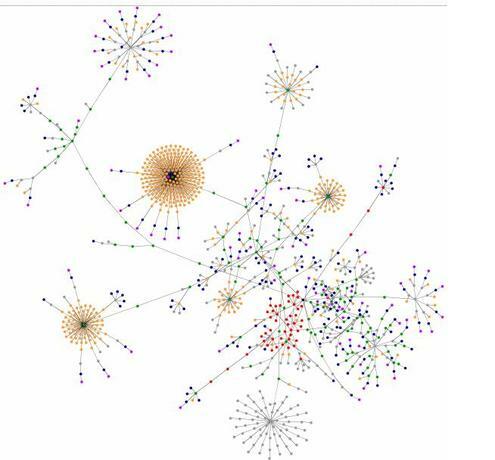 Interesting, with all those embellishments. I have my eye on the Flotsam, so Florida. 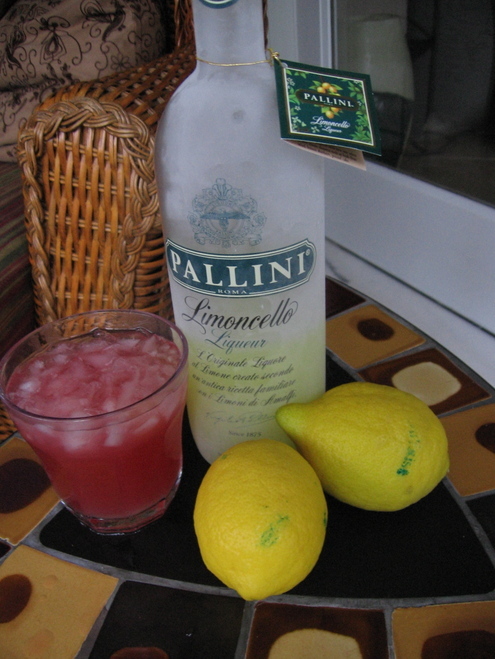 I have been trying to balance my knitting with some other crafty things that I like to do but are not as portable. I have a few items on m y sewing table and a couple of things that I’m stitching up. Among the stitchey stuff is an angel whose pattern was stuffed in a box of cross stitch things. I haven’t cross-stitched anything in years. I liked the pattern and thought that I could make it for someone as a Christmas gift. I have a couple of blouses in the works. The yellow one’s fabric came from a shopping trip in Germany. The pattern is from an old Burda magazine. The white embroidered silk was bought at a yard sale. The woman selling was from Thailand and had a great selection of silks. Again, I used and old Burda magazine for the pattern. Even the house is a work in progress. My favorite drywall guy, Chuck scraped the popcorn off the garage ceiling. Tomorrow the walls receive a fresh coat of texture and then they’ll be ready for paint. Our shop is having a warehouse sale in early November and I will see about picking up some “oops” cabinets for storage. We have some lovely yellow pots and pans cabinets just screaming to live in my garage! Arrived at the hospital around 10:45 this morning. Tom had his backside surgery today, right in the middle of his vacation of all things. I sat in the second floor surgery waiting area and was able to turn the heel on the sock that I'm working on. Francie and Maria found me and we caught up on news. The hospital had a string trio play in the atrium during the lunch hour. It was very serene for a hospital setting. Tom's surgery went well according to the doctor. He should be up and about in the next few days. I ordered the yarn for a baby sweater that I plan on making for Christine's baby girl. Gianna isn't here yet and the sweater is a toddler 2 but I think that the work involved is better spent on that size than a 6 month old. I found a great pattern on knitty. 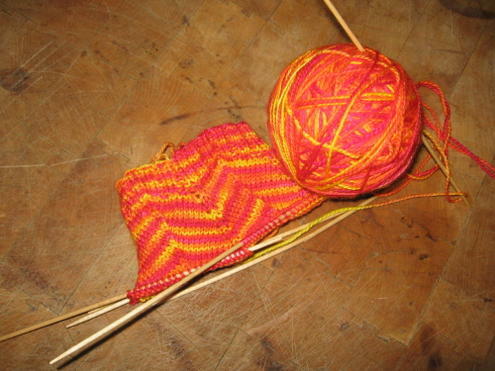 the pattern is called Tigger and looks like it will be fun to knit as well as quick. Well, I do have 2 years. I ordered the yarn , Skacel Luxor and Berrocco Zen Colors from 2 different sources in the same color that the designer used. I'm not feeling very adventurous yet. I will post progress as the sweater grows. My 6 sock progress photo was posted today. This is my first attempt at a knit along. I just hope that I can keep up with the group. I don't really wear socks and I hav e yet to find a sock yarn that I love. I do love to knit them though. Socks are quick, cheap and portable. Maybe the "yarn of my dreams " will appear...someday. Erik's first party, Friday, was a success. I learned a lot about adolescents. That they take up a lot more space than adults do. Their attention spans are as short as ever. Hormones have an aura. I was reminded of something Jackie Kennedy said. Return to work after a rainy weekend. I was actually productive and learned that 8 hour days are easier than 6 hour days. I finished a kitchen and have 2 more to go before I'm caught up.